I found your blog about 6 months ago but have never commented. Thanks for what you do! I have learned so much from your posts. Keep it up!! I have never been to ES, but am strongly drawn to learn more about the country. Thanks for your blog and hard work. I am preparing for my first visit to ES in February with my boyfriend who is Salvadoran and I really appreciate all the information you are collecting and disseminating. Gracias, por tu trabajo, Tim. Y felicidades por el aniversario de éste espacio. Que Dios te bendiga. Yeah, I love this blog. Very informative and I find it very balanced, which is difficult to do when wading into such polarized topics. thank you very much! 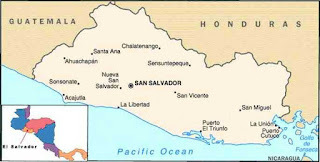 I don't know of any other source of such detailed info on El Salvador. I admire your continuing efforts to produce this so often and with such helpful content. You provide a wonderful service to all who are interested in El Salvador. Congratulations are in order, Tim! I'm one of the silent followers of your blog. I wanted to thank you for writing it and encourage you to keep up with the good work! Wow four years. I've been looking at this blog almost daily for my news in ES. I came across here three years ago and haven't stopped visiting. I would never of thought a Lutheran from Milwaukee would be one of the most visited bloggers outside of El Salvador. Congratulations Tim. Please keep it up. Happy blogiversary! I'm another appreciative reader. y olvidate de las palabras mayusculas -que no estoy gritando- estoy celebrando tu dedicacion y amor por ese pequeno pais, asi que solo me queda decirte: GRACIAS! Felicidades por tu blog esta muy entretenido, e informativo. Thank you for all the info in your blog, felicidades por estos an~os de informacion. Felicidades, Tim! Hemos seguido tu blog por mucho tiempo y siempre va al grano. Nos inspiraste empezar uno para comunicar sobre la campana para rescatar la Universidad Monsenor Oscar Romero en Chalatenango. Thank you for providing this critical view into social justice in El Salvador. I've been checking in almost since the beginning. My wife grew up in the Christian Base Communities of El Salvador and I have travelled there with her. You're blog is a vital connection to current events back home. i am currently the coordinator of a health care team that travels to parts of rural El Salvador. we are planning our second trip for April 2009. I have highly recommended your blog to all the team members. this blog allows them to prepare for the trip. it provides them understanding of the social, economic, political and cultural realities of working with the people in rural El Salvador.